Cleaning with vinegar is one of the best ways to clean your home naturally. Not only is vinegar cheap, but you’ve probably already got a bottle in your cabinets. The biggest question I’ve always received, though, is what kind of vinegar to clean with? How Does Vinegar Kill Germs? Before you decide what kind of vinegar to clean with, it helps to know how vinegar cleans and disinfects your home. How can a nontoxic food product be such a great disinfectant too? It’s all about the acid. Vinegar is made of acetic acid. The acid in vinegar can actually travel through a bacteria cell’s membrane and cause it to die, according to this report. That is why vinegar can actually kill salmonella, E. coli and other nasty stuff that you don’t want on countertops, toilets, dishes, etc. Vinegar (especially malt vinegar with 10% acid) can effectively kill the flu virus, according to this study. Vinegar is also great at killing tuberculosis bacteria, according to this clinical study. Plus, vinegar cuts through grease, remove hard water deposits, and more! What Type of Vinegar is Best For Cleaning? Go to any vinegar aisle in the grocery store and you’ll see different types of vinegars: white distilled vinegar, apple cider vinegar, specialty vinegars, etc. At this point, you will probably start panicking and wonder what kind of vinegar to clean with? Vinegar is a great nontoxic cleaner because of its acidity. So just about any vinegar would be great to kill germs with. 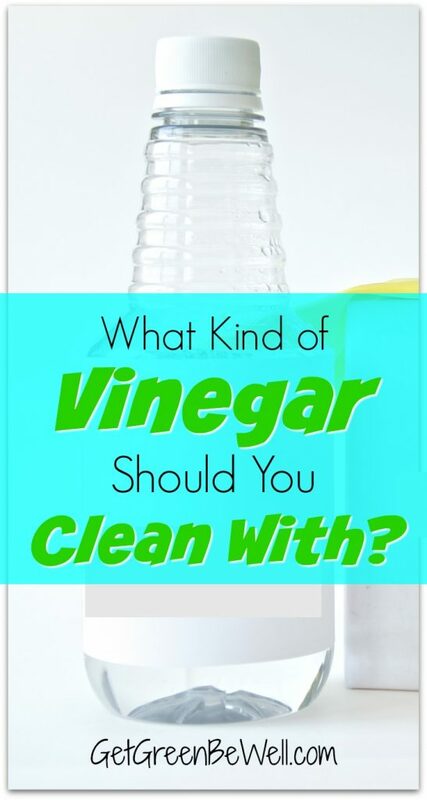 Yet white distilled vinegar is definitely the absolute favorite for green cleaning. White distilled vinegar is the clear liquid that you will find in lots of different sizes of bottles in the grocery store. White distilled vinegar is often made from grains, such as corn. It can be produced for super cheap, compared to specialty vinegars using wine or apple cider vinegar that is raw and unpasteurized. 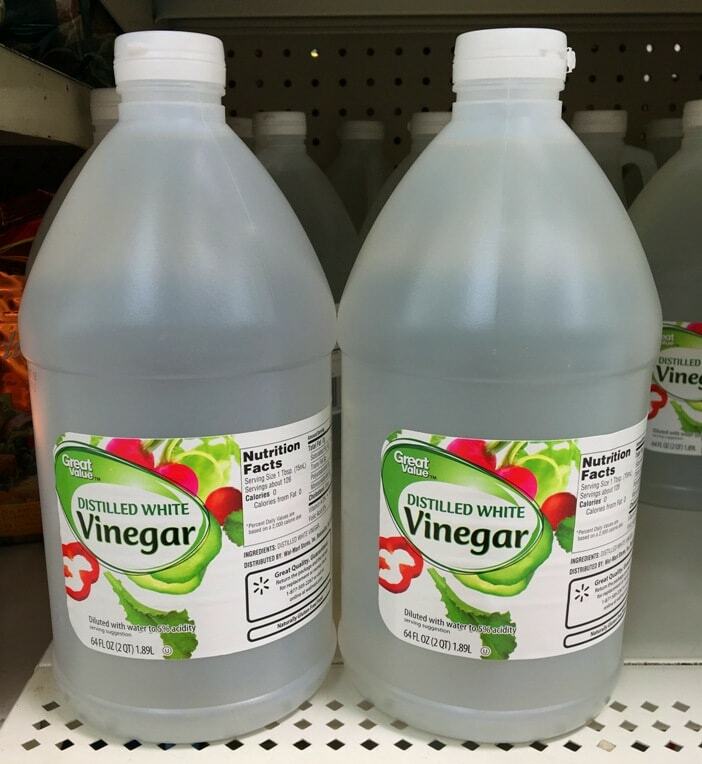 White vinegar can be bought by the gallon at major retailers for just pennies per ounce. Not only can white vinegar be used both for cooking and cleaning, but it is biodegradable, too. That means that this multipurpose product is safer for the Earth and our waterways than chemical-laden cleaners. Can you use apple cider vinegar to clean? Yes! But it depends on what you are cleaning. In general, apple cider vinegar can be used to clean just as effectively as white vinegar. The question is, would you want to, though? Most other methods of using vinegar to clean (such as a vinegar spray or vinegar wash) can easily substitute apple cider vinegar instead of white vinegar. The smell of apple cider vinegar might be a bit more pleasant than white vinegar. However, if you use the apple cider vinegar with the “mother,” such as Bragg’s apple cider vinegar, you are paying for extra health benefits that will be lost using it as a green cleaner. The “mother” in apple cider vinegar is beneficial bacteria that’s great for ingesting it, but is not necessary for cleaning. It is an expensive substitution for cleaning with vinegar. Even apple cider vinegar without the “mother” can be more expensive than white vinegar. A recent price comparison at Target showed that a 64 oz. bottle of white vinegar was 0.03 cents an ounce and a 64 oz. bottle of apple cider vinegar was 0.05 cents an ounce. 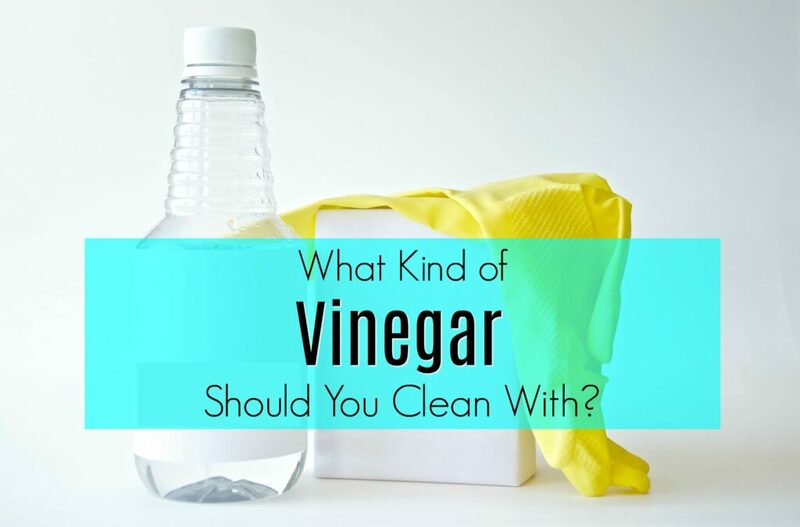 What is the difference between cleaning vinegar and white vinegar? Cleaning vinegar sounds like the perfect solution for green cleaning around the home, right? After all, if you’re wondering what kind of vinegar to clean with, you would probably choose a product labeled a cleaning vinegar. Whether or not you need to buy a special cleaning vinegar depends on how much money you want to spend, how much you hate the smell of normal vinegar, and what you are using it to clean. For instance, Heinz All Natural Cleaning Vinegar suggests it is the perfect answer for all of your natural cleaning with a special cleaning strength. Heinz also states that the Cleaning Vinegar is safe for cooking, too. Yet the acidity is 6%, only 1% more acidic than normal white vinegar. White House, another big brand for vinegar, also has their line of All Natural White House Foods Cleaning Vinegars. Choose either unscented or one of their lemon or lavender scents. Their cleaning vinegar is 6% acidity, as well. Is that extra 1% of acidity going to do much more for your normal day to day cleaning? That’s your call. Of course, cleaning vinegars can actually have a less powerful acidity than normal white vinegar, too. The Laundress Scented Vinegar is a pleasant smelling vinegar great for cleaning. It’s just vinegar and fragrance. Aunt Fannie’s Cleaning Vinegars are a line of different scented vinegars at 3.5% acidity using essential oils and a sugar surfactant (a common substance in cleaners and this one is all natural). You can always make your own scented cleaning vinegar using essential oils, such as this recipe for an all purpose kitchen cleaner. Of course, some cleaning vinegars are actually industrial vinegar. That’s completely different when making your decision. Keep reading to see why. Most vinegars that you will find in grocery stores are 5% acidity. Some specialty vinegars will have a 6-10% acidity. With so many choices, it’s definitely hard to decide what kind of vinegar to clean with. Vinegar with a high acidity is called industrial vinegar or agricultural vinegar. It can come in strengths such as 20% acidity, 30% acidity and higher. The higher acidity makes industrial vinegar a potentially harmful product to be working with, even though it is natural. You MUST make sure that you take proper precautions to not splash the product on your skin or in your eyes. The smell is extremely strong, as well, so proper ventilation and even wearing a mask is a must. What Do I Use Industrial Vinegar For? So why is there such a strong vinegar for sale? Industrial vinegar or agricultural vinegar is great for using outside. Industrial vinegar is great for killing plants quickly. Even the toughest plants and weeds. Perhaps that’s why it’s also called agricultural vinegar. I used industrial vinegar to kill weeds in my driveway and patio and shared my tips and tricks for organic weed killing. But I learned a lot about the dangers of industrial vinegar while using it. It is extremely noxious to smell. The smell is so strong that it burns. And it will linger in your backyard and make your neighbors think that you are strange. While using agricultural vinegar on my patio bricks to kill weeds in between the stones, I found that the industrial strength vinegar actually bleached the stones for a few days. They seemed to bounce back and not be bleached anymore, but definitely do a patch test first. Can you use balsamic vinegar to clean? Balsamic vinegar can have an acidity similar to white distilled vinegar. Which means it could cut through grease. However, balsamic vinegar is very dark. It is made from grape must, rather than grains that white distilled vinegar is made from. The color and darkness of balsamic vinegar means this vinegar is not smart to clean with. It can stain the surfaces and fabrics you are wanting to clean. Plus, the cost is way more than white distilled vinegar. There is no reason that you would want to clean with balsamic vinegar. Can you use white wine vinegar instead of white vinegar to clean? Yes, you can use white wine vinegar to clean. However, the cost of the specialty vinegar would make it much more expensive to use than white distilled vinegar. Only use this option if you’re trying to use up a bottle of white wine vinegar that you are getting rid of anyway. Where can I buy vinegar for cleaning? Now that you know what kind of vinegar to clean with, where should you buy vinegar for cleaning? Vinegar can be found in all major retailers and grocery stores. We love buying it at Walmart. Specialty vinegars, such as industrial vinegar, can sometimes be found in garden centers. I have only found industrial vinegar in small, independent garden centers. I also found 20% vinegar in German markets. Some people have reported seeing agricultural vinegar in mass retailers, such as Lowe’s. It might depend on your specific store and location. Vinegars with a strong acidity can be bought online. Amazon is a great place to buy vinegar. Amazon’s brand of vinegar is actually a really great deal, and as part of Prime Pantry you don’t have to worry about shipping charges for the weight. Thanks to Amazon’s partnership with Whole Foods, you can buy organic white vinegar for a really great price, too! The weight of a vinegar bottle is heavy, which means that shipping costs can be huge on other sites. Keep that in mind. Use Amazon Prime for free shipping for Prime eligible items. Vinegar is great for cleaning toilets! Here’s the easy ways to use vinegar to clean a toilet. And, check out these easy homemade toilet bowl cleaner tablets to make!